We decided to talk about some of the ways professionals most definitely distinguish themselves from amateur CCWers, or in other words, what are some of the “noob” mistakes that are made. Listen in and make sure you're not making these mistakes today! Press ‘PLAY' above to listen now! Pig Lube Rifle and Handgun Cleaning Kit. Hopefully by now you’ve heard about my favorite gun lubricant, Pig Lube. You may have also heard about their recent launch of PLC (Pig Lube Cleaner), a gun cleaning solvent. Now you can get Pig Lube, PLC together with a complete handgun and rifle cleaning kit. With quality brass brushes, jags, loops and cleaning swabs, this 30 piece kit has everything you’ll need to thoroughly clean all your guns including shotguns. 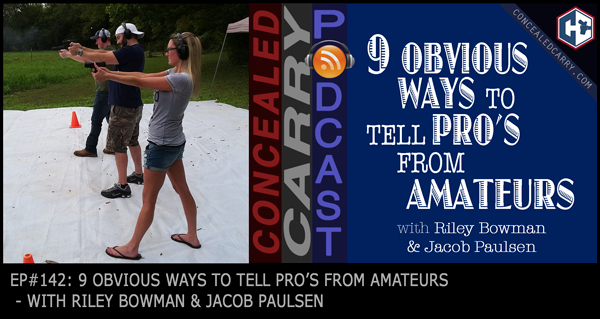 Check it out at ConcealedCarry.com and use the coupon code “PODCAST10” to save 10%.